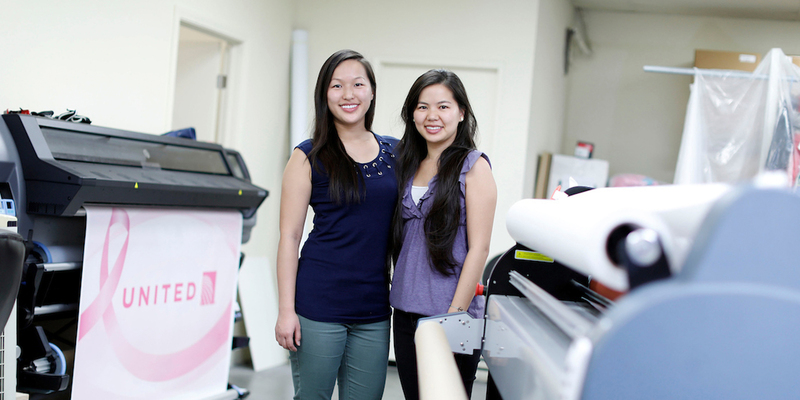 Lorraine (left) and Lillian Tsui in their Alhambra print shop. Photo by J. Emilio Flores. The pair first started printing shirts for their friends for fun while in high school, but the business took off as they studied art and learned design skills at Cal State LA. Lillian Tsui graduated in 2016 with a bachelor’s degree in art and an option in animation. Lorraine Tsui, who majored in art with a graphic design option, graduated in 2017. The sisters now run TMJ Printing, a branch of their parents’ company, TMJ Products, which manufactures parts for airlines and ground crews. Lillian and Lorraine Tsui shared lessons they learned at Cal State LA that help them succeed in business today. 1. Meet deadlines and manage time wisely. “One of the reasons airlines choose us is we’re able to get things done quickly,” Lillian Tsui says. The sisters will sometimes receive last-minute orders. They learned to stay on top of projects while at Cal State LA. Occasionally now, they have to pull all-nighters, harkening back to their days at the University. “Whatever it takes to get the work done,” Lorraine Tsui says. 2. Presentation is everything. Cal State LA’s art faculty stressed the importance of immaculate presentation, the sisters say. Professor Connie Utterback, in a color theory course, taught of color harmony and the nuance among hues. They can now notice the most subtle difference between colors and have an eye for what works visually. This attention to detail is imperative for their business. “All the products that we give out have to be perfect,” Lorraine Tsui says. 4. Become lifelong learners. The technical skills they learned in classes at Cal State LA have proven invaluable. Both Lorraine and Lillian Tsui credit the University with teaching them to navigate design software, like Adobe Photoshop and Illustrator. They’re now able to create and print original designs rather than only printing those created by others. In a class with Cal State LA Professor Richard Wearn, Lillian Tsui constructed a furniture piece that still sits in the sisters’ office. The skills she learned in another 3D modeling class allowed her to model and design a luggage tray for United Airlines. The two make time to update their skills as software and technology advance.